Many would say that with the GE Fuel Nozzle, the 1000 additive parts in the Airbus 350 and now the GE ATP engine, additive has already arrived in aviation. But this week we witnessed an event greater acceleration: At Hill Air Force Base, engineers are already validating and installing replacement parts for their $150 million F-22 aircrafts, printed to the highest standards and with greatly enhanced lead times and life-cycles. If you couple the capabilities of 3D printing with predictive maintenance and an intelligent IIoT network of manufacturing and storing, there’s opportunity to redefine the whole model. Airbases are already disposing 3D printers for in-situ manufacturing and new partnerships are bringing more and more industrial capabilities to the runways. At Authentise, we’re proud to apply the principles of predictive maintenance to our customers’ printers themselves, bringing an added tier of intelligent planning, along with a pervasive MES framework that can bring this dream to the real world. The world’s most expensive fighter jet soon may be flying with parts made from a 3D printer. Maintainers at Hill Air Force Base, Utah, last month installed for the first time a metallic 3D-printed bracket on an operational F-22 Raptor, according to the Air Force and Lockheed Martin, the company that produces the $150 million aircraft. “Once we get to the more complicated parts, the result could be a 60 to 70 day reduction in flow time for aircraft to be here for maintenance,” Robert Lewin, 574th Aircraft Maintenance director at Hill. Travis Air Force Base (AFB) in Fairfield, California has recruited the help of 3D printing technologies. 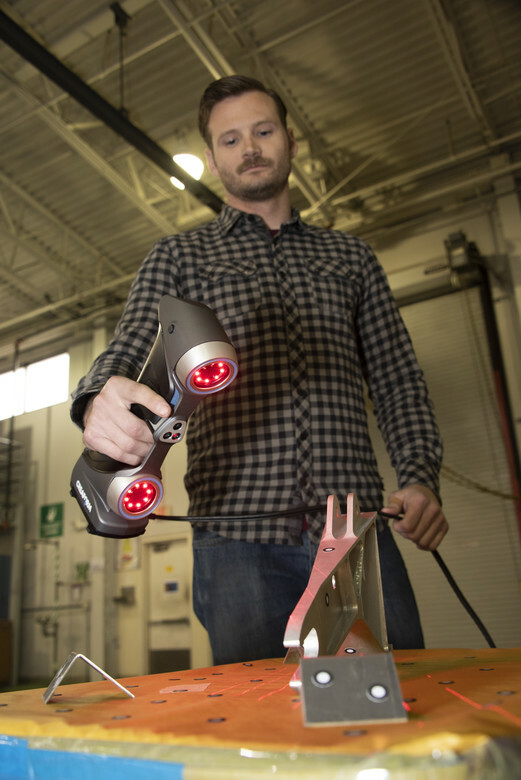 The Air Base has employed 3D scanners to reduce maintenance time. Having 3D printers on the base will ensure rapid replacement of aircraft parts. “Once we have this additive manufacturing capability in place, we will likely be able to print and replace parts in a few hours and return our aircraft to flying status much quicker,” Master Sgt. Christopher Smithling, assistant section chief for aircraft structural maintenance, 60th Maintenance Squadron. Industrial 3D printing company EOS and Etihad Airways Engineering, the largest aircraft maintenance, repair and overhaul services provider in the Middle East, have agreed a strategic partnership which will significantly expand local capabilities for industrial 3D printing in aviation. Following a structured selection process, suitable cabin interior parts will be produced through the AM process, which offers a substantial value-add in terms of optimised repair, lightweight design, shorter lead times and customisation options, particularly during aircraft modifications.